What Does a Trump Presidency Mean for Global Competency in Education? 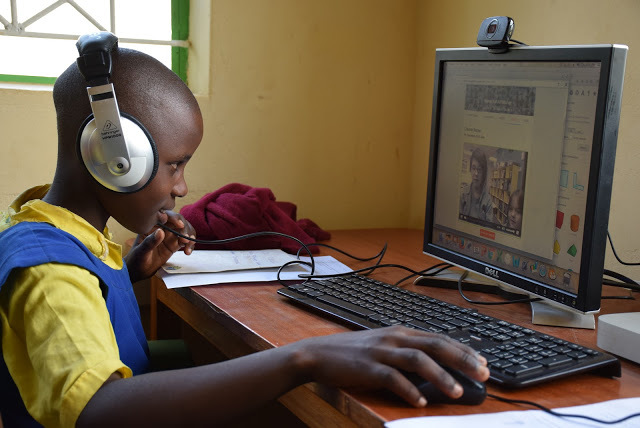 A student at Kenya Connect watches a video message from a partner student in the U.S. as part of their Level Up Village global collaboration. In a constantly changing world, Level Up Village is committed to fostering peace around the globe by building empathy and understanding between students of varied cultures, backgrounds and perspectives. While President-Elect Trump’s views on education are not yet clear, we do know that he wants education to be locally driven, that he is strongly in favor of school choice and he wants to shore up early childhood education. Even though there are many unknowns in terms of how a Trump presidency will shape education policy, it is imperative as a nation that we use this opportunity to show our children how to build and grow together, and how to acknowledge and accept our differences, rather than let them divide us. We at Level Up Village will continue to pursue our mission to globalize the classroom and help students develop 21st Century skills. We know that to work successfully with people from different cultures and backgrounds, students must develop empathy. In fact, empathy is an essential 21st Century skill that lays the groundwork for global citizenship. Children should start young so that multicultural interaction becomes something natural to them. We are lucky enough to see the impact of this early global interaction every day in our virtual exchanges: children tell each other with bright eyes and broad smiles about their differences, eager to learn more about their global partners’ experiences and way of life. We agree. Our goal at Level Up Village is to encourage students to build connections across differences, boundaries and borders. These connections are pathways that allow them to be the architects of the compassionate, empathetic and ethical societies in which they want to live. No matter the changes of today or tomorrow, we must all work together to give students the opportunity to develop global competency so they can face the challenges of an increasingly complex and interconnected world and feel empowered to make a difference.